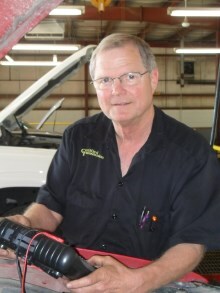 Barry has over 40 years of automotive experience. He has done everything from managing, owning and operating his own general repair facility to working in transmission industry. He’s a ASE Master tech. with L1 advance level diagnostics, the highest level of certification available. He’s also our shop foreman. He’s the one behind the scenes getting your vehicle fixed right the first time. My first encounter with a Nissan CVT was an interesting experience. Our wholesale customer had diagnosed the transmission as being bad, so the transmission was then replaced. After replacement, the vehicle owner stated that the car would not accelerate beyond 40mph. Since the installed transmission was purchased from us, it then became our responsibility to find the root cause of the problem and get the transmission working properly. We verified the customer’s complaint with the initial road test, and then began diagnosing the cause. There were no codes in the PCM, TCM, or any other modules. The Tire Pressure Monitor light was on. Upon checking into the cause of this, it was discovered that the right rear tire sensor would not initialize and was causing the warning lamp to remain on. When I road-tested the vehicle, I found that it would change ratios up to about the 4th (.7 ratio) gear range, but would not change above that ratio in the manual shift position (it has 6 range positions; the highest is around .4 ratio). The indicator in the dash would show 5th and 6th range when manually commanded, but there was no change in ratio giving an engine rpm of 3,000 at 50 mph. It would start out at a ratio of 2.37, and increase to a .7 ratio with a step motor reading of -6 to 169. Per the service manual specs, the step motor should have a range of -20 to 190 with a gear ratio of 2.37 to .43. I did have converter lockup at about 10 mph which is common on all CVT’s, but could not get the ratio above .7, or equal to the 4th range. After researching the service manual, I found that initialization of the TCM is required after a transmission replacement. I then performed the initialization routine, and surprise! I lost converter lockup. During the initialization process the instructions direct you to go to the calibration screen. Next, you copy all the numbers down, then do the initialization and return to the calibration screen and compare to see if the numbers had changed. If the numbers changed, then the initialization had been properly completed. In my case, the numbers changed, sure enough. However, the numbers changed to all letters, specifically “F”! Looking at the PID data, everything looked okay except that the transmission temperature value on the screen was about 100°F too high. On a road test it displayed 300°F, but checking the pan with an infrared thermometer, true fluid temperature was only 170°F. It was also discovered that the actual sensor voltages were correct, but the scanner was displaying the PID voltages incorrectly. At this point I decided to take it to the OEM dealer and have the TCM re-flashed, with hope that that it might solve the problem. I was informed that the PCM had the most current calibration, but that the TCM needed updating. The dealer performed the TCM re-flash, and I thought my problems would be gone. Unfortunately, the vehicle still had the same 40mph limitation, and still had no converter lockup. We then searched and found a used TCM in an attempt to prove whether or not the TCM was at fault. After we installed the used TCM the converter lockup resumed, but the ratios we had hoped to see just weren’t correct. On the next road test it still had a .7 ratio @ 3,000 rpm, while traveling 50mph. Again, per the recommendation when changing the transmission or installing a used TCM, the service manual instructs that an initialization should be done. The definition of insanity is to do the same things over and over but expect different results, so guess what? I did the initialization and surprise! No converter lockup! Lesson learned: on the CVT TCM, do not do an initialization!!! I contacted ATSG, but they hadn’t had much experience yet with the Nissan CVT, and didn’t have much more information than I already had researched. However, the tech that I talked to said that he could not see the need to initialize the TCM. Since there are no gear changes as in a traditional type transmission, and it only has two variable pulleys that change diameter as the stepper motor moves them on a kind of fulcrum, there is no need to relearn volumes of clutches, or shift timing. We picked up another used TCM, but did not perform the initialization. After installation the TCC lockup came back, but still had issues with incorrect ratio and stepper motor values. I spent a late night on the Nissan web site and read everything I could about this transmission and searched IATN for any suggestions that might be of value. I saw some that had ABS and engine drivability problems that caused shift issues, particularly weak wheel speed sensors that can affect throttle control, yet will not set a code. One easy way to check if the ABS system is affecting a drivability issue is to disconnect the ABS module and drive the vehicle. You will lose speedo functionality, but if the drivability issue disappears you then know that the ABS system is the cause. In my case, disconnecting the ABS module did not improve the issue. The next morning I started browsing through all of the data in each module and noticed that, when cold, the engine temperature showed about 60°F while the intake air temp showed 98°F. The MAF grams p/s was in range with no codes, and the engine ran fine. Still, the intake air temp reading was almost 40°F off. We picked up a used mass airflow sensor from a salvage yard for $50, and installed it. On the road test PID data displayed a .48 ratio with a stepper motor reading of 175, and with a speed of 60 mph the engine speed was 1,800 rpm. All systems now appeared to be normal, and in the end, the customer left pleased to have a fully-functioning vehicle again. After discovery that the MAF sensor was the root cause of the problem, I learned the moral of the story: because of the information that is shared across a CAN-bus system, sensors and inputs that affect one electronic subsystem can have a direct impact on another subsystem. Therefore, in order to effectively diagnose these types of vehicles, you need to “look outside the box”, so to speak, and investigate other systems that might be causing your issues. You might be surprised at what you find.